Back in May I sold a foreclosure home on St. George Island to clients from Texas, and the home had been stripped of all furniture, appliances, etc. So, after the heady excitement of landing the deal at a great price, the new owners prepared to tackle refurnishing the home, from the ground up. This is not an easy task, even when you live close by (and they didn't) and when you have malls and huge furniture showrooms to shop in to your heart's content (we don't). 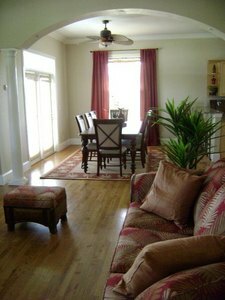 I introduced my clients long distance to Adele Hungerford, who lives in Eastpoint, on the mainland just across the bridge from St. George Island, www.adeleinteriors.com. Somehow, over the phone and email, and with a few carefully chosen photographs and pictures from magazines, Adele was able to zero in on exactly the style of house that my clients wanted to create. She shopped locally, at Tiffins (www.tiffinsinteriors.com) and otherwise, as well as all her favorite haunts in Tallahassee to outfit this home in style. I just took pictures of the house and sent them to my clients in Texas today, and it so wowed me that I thought I would share this one shot - I think this is the best Adele creation I've seen so far. She really got at what the clients wanted, and it's definitely a style all its own. The drama of the finished greatroom is impossible to capture in a photo, but when you walk up those stairs and see the whole space in its put together state - just wow. My clients are ecstatically happy with Adele's work (this latest of which they've seen only in the pictures I've sent! ), and I am very pleased for them. Thank you, Adele!